You know when someone is talking to you with extreme passion about something you’ve not previously been that interested in, and you can’t help but get sucked in to their argument, even though you’ve got no idea what it is? That’s how I often feel about No Sister. Everything they do is so intentional, so serious that I forget to roll my eyes at their use of the kind of art-rock, playing-guitar-with-a-screwdriver business that would usually be Not My Vibe. So No Sister make kind of pretentious music, but at least they’re not pretending to be on the dole or like they didn’t go to uni. They don’t pretend to be approachable, #relateable fuckups – they’ve talk to you from a place of knowledge and foresight. Like lookout motherfuckers cuz it’s time to get mad. And there’s nothing wrong with being a bit pretentious if it’s for a good cause – like for some of the most vicious, vital music you’ll hear this hear. Its pretentious music that rules, seethes and gnashes its teeth, scowling in righteous anger. The were like this even before they moved from Bris to Melbourne. The lyrics seem lean on more personal stuff – there’s more yous and mes and hims and hers in these songs, less burning cities and shards of glass. ‘Honey Hunter’ sounds like someone very sinister, the snippets of ominous detail repeated; ‘indefensible, heavy breathing’ ‘in a pure world, he found her’. The No Sister side stays restrained – held in by the tightness of the sound, the dry brittleness, There’s a calculated feeling even when the guitar devolves into noise, but Bitumen are absolutely balls to the wall, especially on ‘Winter Swimmer’, with that crunchy metal rhythm guitar under all the shredding, deep and dark with rumbling bitterness, a kind of fucked-up desperate devotion ‘I’ll do what needs to be done / I’ll do what needs to be done/ for you’. It’s kind of a head/heart divide, except both are working together in violent revolt against outside forces. And, if making a good as tape counts as any kind of victory, absolutely kicking their arse. Get this tape via always rock solid Vacant Valley. 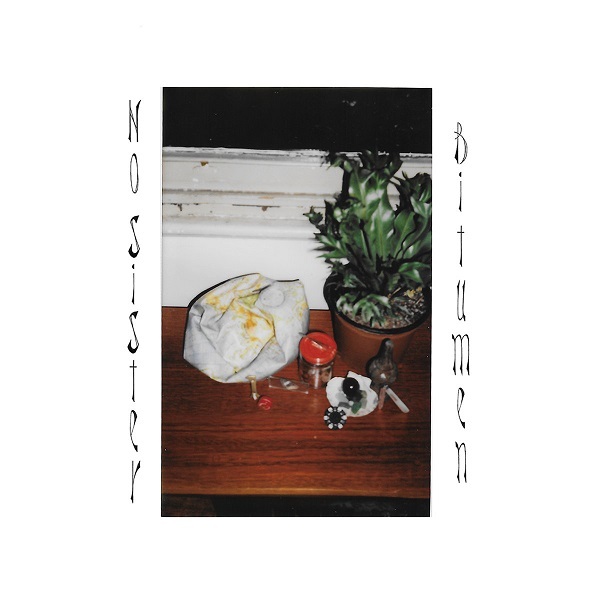 See Bitumen and No Sister in Brisbane tonight at The Bearded lady with formidable support from Pleasure Symbols and Clever and on Sunday at The Time Machine in Nambour supported by the nice guys of hard rock Sewers, or next Saturday April 22nd in Melbourne at the Tote with Stationary Suns and Synthetics (who I hear are very good).